ELVIS PRESLEY’S FAMILY TREE – Elvis’ father Vernon Elvis Presley was born on April 10, 1916 in Fulton, Mississippi. Vernon’s parents were Jessie D. McClowell Presley (1896 – 1973) and Minnie Mae Hood Presley (1893 – 1980). 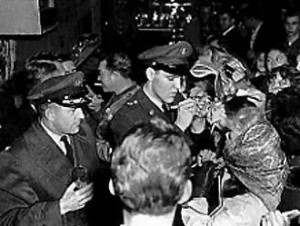 Only time Elvis Presley set foot on British soil was March 3, 1960, while Elvis was returning home to USA after finishing his US Army national service. His military flight touched down for refuelling at Prestwick airport in South Ayrshire – which was until 1966 home to an American forces base. 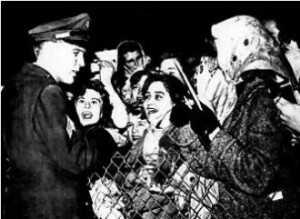 With time to kill, Presley and his fellow troops disembarked and mingled with the dozens of fans who were there waiting for him. E lvis’ mother Gladys Love Smith was born on April 25, 1912 in Pontotoc County, Mississippi. Gladys’ parents were Robert Lee Smith and Octavia Luvenia “Doll” Mansell. Octavia was said to have received her nickname “Doll” because she was a very beautiful and fragile woman. She gave birth to nine children and was bedridden most of her life, dying at the age of 59 from tuberculosis. Gladys’ father Robert was a handsome man with black hair. He was a cotton farmer and an occasional moonshiner. He would often pick up extra jobs to help support his large family. In his fifties, he died suddenly of pneumonia, leaving the then 19-year-old Gladys to find work in Tupelo as a seamstress to help support the family. They say from small acorns grown great oak trees and so it was with the story about Elvis’s ancestry being traced to Lonmay, Scotland. What started out as a simple idea by the Aberdeen and Grampian Tourist Board became a worldwide search. Such is the power of the name “Elvis Presley”. Allan Morrison met Bill Burk after he read his book “Early Elvis, the Tupelo Years” and was intrigued by Bill’s mention of Elvis’ Scottish ancestry. Being a Scotsman, Allan started to do his own research. 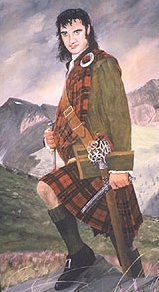 The mythology was that Elvis’ family had derived from Paisley in Scotland and that somehow Paisley became Presley. It was common for emigrants to the USA to adopt the name of their home town.